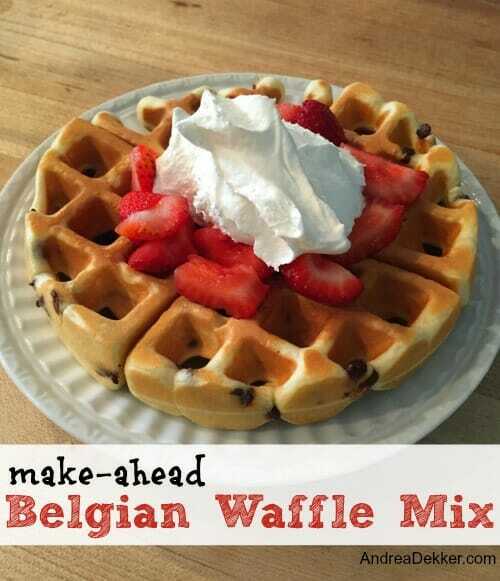 Over the past 5-6 years, I have thought about sharing my extremely simple Belgian waffle recipe countless times… but for whatever reason, I always decided to share a different recipe. Then, a couple weeks ago, I mentioned my Belgian waffle recipe in a post and was flooded with emails and comments asking to share it here on the blog. So I finally took some pictures and typed up the recipe in hopes that you will love it just as much as our family does! As you’ll see below, I make a big huge batch of the dry waffle mix in advance, and then all I have to do when we want waffles is mix some of the dry mix with milk, eggs, and oil to make the waffle batter. 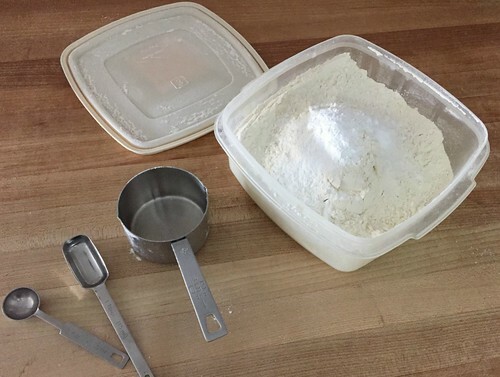 Mix the dry ingredients together in a large food storage container with a tight-fitting lid and store at room temperature. It should last for many weeks, even months. In a small bowl, mix dry ingredients, eggs, milk, and oil together with a fork (batter will be quite thick). Use 1/2 c. measuring cup or ladle to scoop about 1/2c. 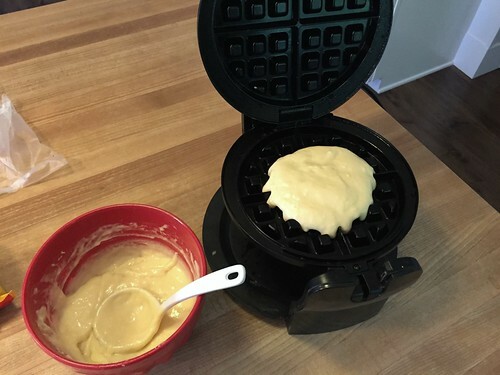 of batter onto a hot waffle iron. Top with syrup, fruit, whipped cream, or any other toppings. 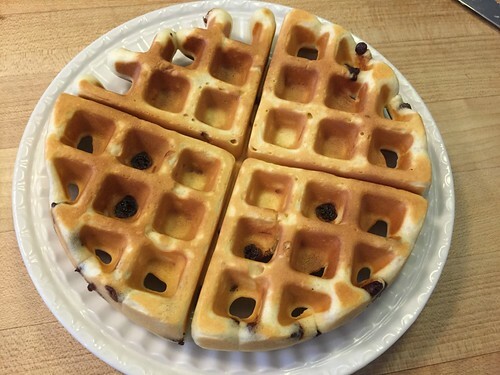 As you might have noticed in the pictures above, I have the waffle batter recipe stuck right to the container of dry mix — this way, Dave can easily mix up his own waffles! 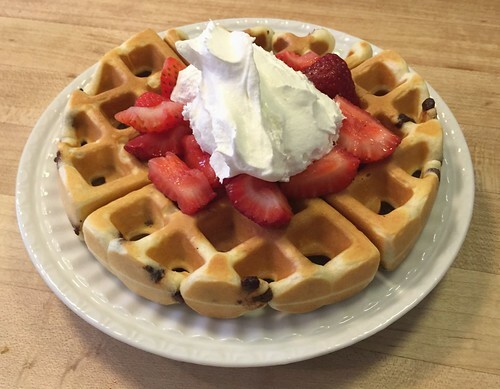 We have Belgian waffles at least once or twice a week — interspersed between pancakes on the “off days”. 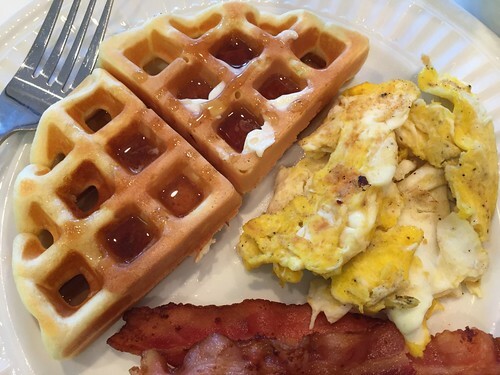 We also have waffles for dinner somewhat regularly (they are Dave’s favorite) so I have made this recipe hundreds of times over the past few years! Awesome! We had these tonight and they will now be my go-to recipe. I always know a recipe is a keeper when my husband mutters “mmmmm” after only one bite. Thank you for sharing. good! It became our go-to recipe after the first time we had them. Glad you like them too! I made this recipe this morning, but did pancakes because I didn’t feel like getting the waffle maker out. I added about 1/2 cup of applesauce that needed to be used up and a bit of cinnamon/sugar mix…and a few white chocolate chips (per my little one’s request). They were gobbled up quickly! sound yummy Sarah! And good to know that it worked for you to freeze them too! I froze a few. They were great reheated in the toaster or toaster oven after letting them thaw a few minutes. We love waffles too. I’ve used a make ahead recipe that keeps in the fridge for several days. I’ll have to try yours now. I have 2 waffle makers which makes the process so much quicker. 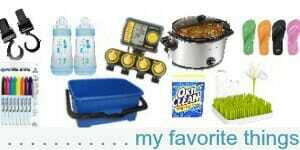 Around black Friday Khols does a small appliance sale and you can get them almost free after rebate. I think my 2 waffle makers and one griddle ended up being under $2 a piece. I’ve bought them for several years and given them as gifts to family and friends. As my kids get older I’ll have to upgrade to more waffle makers. Yummmm! I need to try this recipe. I have memorized your pancake recipe and mix it half with Kodiak Cakes protein pancake mix. It keeps in the fridge for a few days, so I can make them fresh daily. My girl loves her pancakes and waffles too! Yes, we love the pancakes too! I’ve never heard of that protein pancake mix — I might have to look into that! 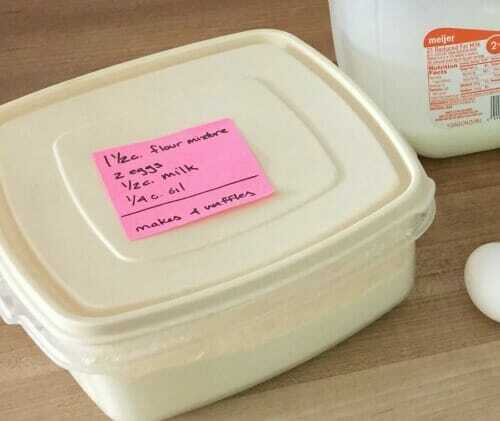 Can this recipe be used for pancakes as well? We have an awesome pancake recipe that I’ve been making for YEARS and YEARS so I have never tried this as pancake batter — but I’m sure it couldn’t hurt anything to try it. Thanks for sharing! I have tried several different recipes through the years with none that stood out. Hopefully, yours will be what we are looking for. 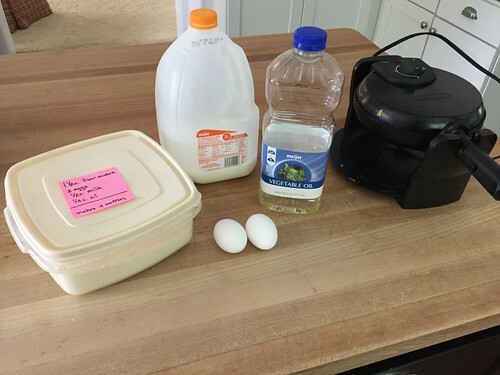 With three school aged kids, I like to make sure that they have a hot breakfast every school day morning so a quick and easy mix that I can make myself is perfect! 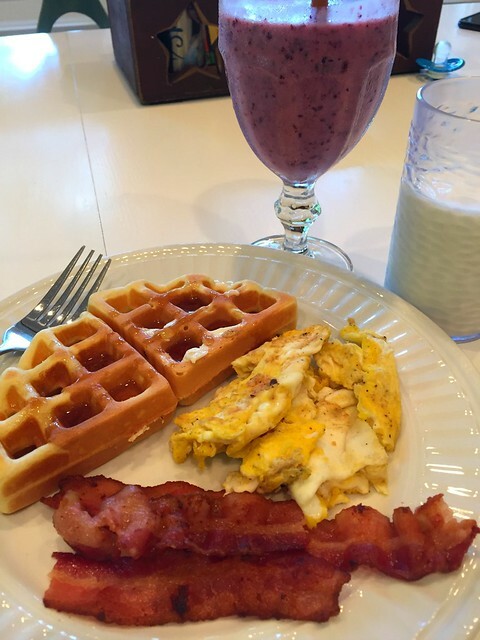 yes, we love hot breakfasts in our house, so I rotate between pancakes and eggs, waffles and sausage, and omelettes and bacon. I keep a bunch of bacon and sausage cooked and ready to go in the fridge, and then I just mix up pancake batter, waffle batter or scramble some eggs! My kids will love this! 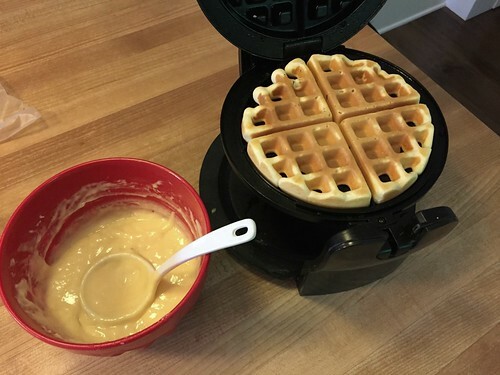 I will love anything to make it easier to make waffles. I don’t make them for the kids that much because i see them as time-consuming. Tell me, do you think you can use self-rising flour and omit the baking powder and salt? yeah, these are SUPER easy! 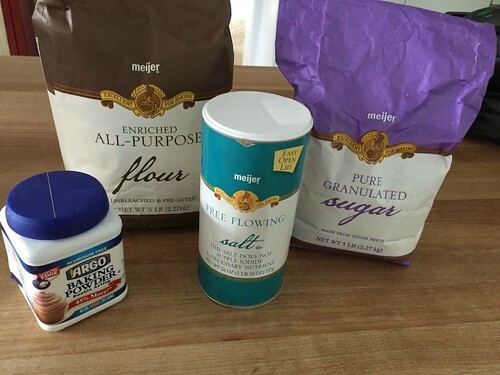 As for the flour — I have no idea. Give it a try and see if it works! What kind of waffle iron do you use? Do you like it? I’ve been looking to purchase one, but hadn’t decided which one yet. We got our waffle iron free after rebate from Bed Bath and Beyond years ago. 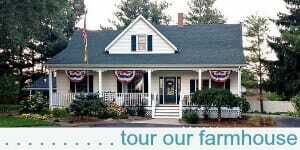 It was not expensive (even before the free rebate) but we love it. The batter never sticks to it and it’s very easy to use. 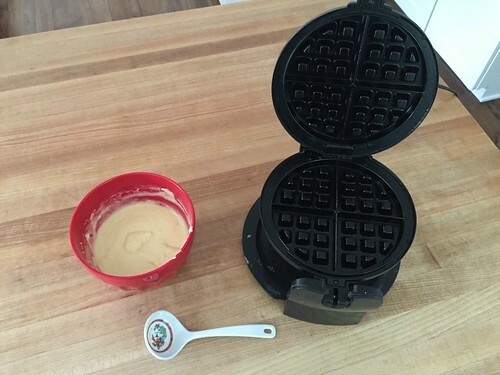 It only takes about 30 seconds per waffle too! 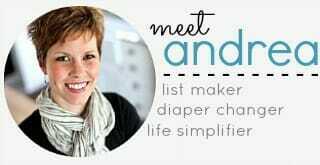 Is your waffle iron easy to clean, Andrea? super easy to clean — in fact, I don’t really even “clean” it. The waffles just pop out so I basically just wipe it down with a paper towel to get any crumbs out. This seems like more of a traditional waffle batter made in a Belgian waffle iron. Most Belgian waffles have a yeast based dough and have egg white folded in. And I’ve been asked for my recipe so many times that I felt like I had to share it!